Grab one while they are hot. Limit 1 per household, Nebraska residents only. In large skillet, cook bacon over moderately high heat, stirring occasionally, until crisp and brown, 8 to 10 minutes. Using slotted spoon, transfer bacon to paper towels to drain. Reserve 3 tablespoons bacon fat, discard the rest. In batches, covering after each addition, add onions to skillet and cook over moderate heat, stirring occasionally, until they all wilt and fit into the skillet. Season with salt and pepper.Reduce heat to low and cook, uncovered, stirring occasionally, until onions are very tender and golden brown, about 30 minutes. Fold back thin end of each tenderloin and tie down with a loop of kitchen twine or plain dental floss. In small bowl, rub lime zest and salt together with fingertips to infuse salt. Stir in chili powder. Rub chili mixture all over tenderloins. Preheat oven to 400 degrees F. In large ovenproof skillet, heat oil over moderately high heat.Add tenderloins and cook, turning occasionally, until browned, about 5 minutes. Transfer skillet with tenderloins to oven and cook until internal temperature reaches between 145 degrees F. (medium-rare) to 160 degrees F. (medium), 12 to 15 minutes. Transfer tenderloins to carving board and let stand 3 minutes. 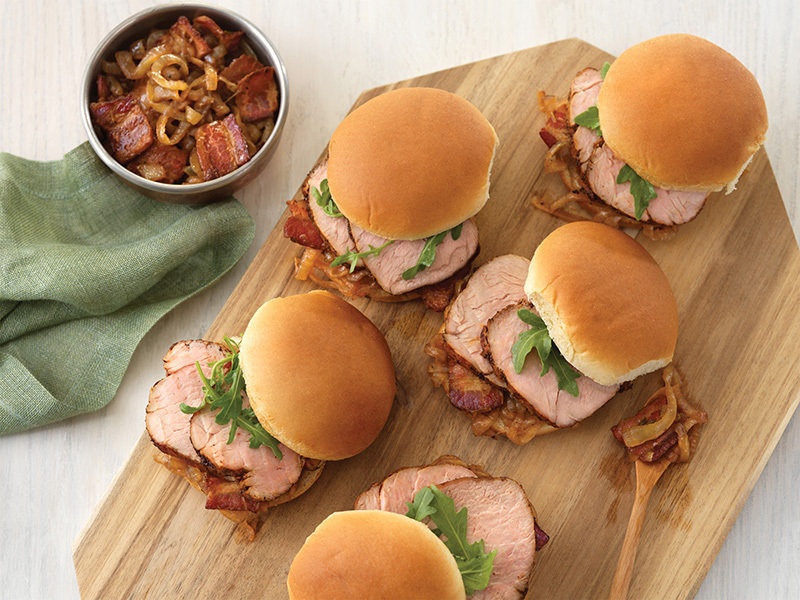 (For cold sliders, tenderloins can be cooled, covered and refrigerated for up to 1 day.) Discard strings from tenderloins. Thinly cut tenderloins crosswise into 24 slices each for a total of 48 slices. Spread bottoms of slider rolls with equal amounts of bacon-onion jam (about 1 heaping tablespoon). Add 2 slices of pork tenderloin, a few watercress leaves and top with bun. Serve hot, warm or at room temperature.